HOW DO YOU SPELL IT? 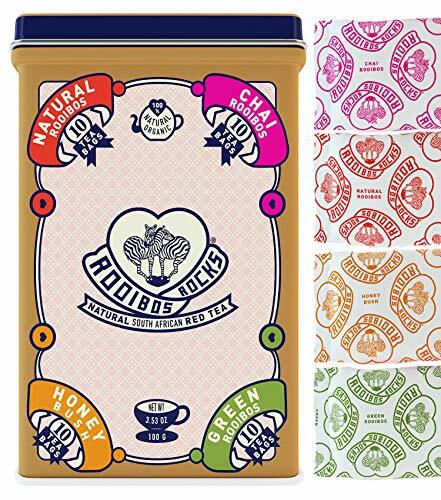 Our gorgeous tea tin contains Rooibos Tea. We see a lot of different spellings for "Rooibos" (prounounced Roy-Boss), here are just a few: roobois roiboos roobis rooibus roobios rooibee roobio robois roibos riobos rubios louibos rooisbos rossibos rubio robios roibois roiboss roobius roobus rooibois looibos luibos robious rooiboss roybos rooiboos ruibos rooibis roybus rooibas roibus ribose roobious roobos roobias robioos robos roobibos. 4 ROOIBOS RED TEA FLAVORS TO SAVOR - Our Rooibos Rocks tea tin is crammed full of flavor. Enjoy 4 packs containing 10 teabags each of our naturally organic caffeine free tea in 4 delicious flavours: honeybush classic ruby red fragrant Chai and light and earthy green rooibos. LIMITED EDITION TEA TIN - Bring the heart of Africa to any kitchen with this holiday season tea tin. The perfect gift for all tea lovers each keepsake tin has an easy open-hinged lid to keep your tea fresh. With its unique South African design it's a one-of-a-kind gift for a one-of-a-kind tea. A FRESH TASTE HIT WITH THE WHOLE FAMILY - With 4 easy to identify color-coded packs everyone will find their favorite flavor. Open each fresh seal pack to discover a delicious alternative to sugar-loaded sodas. Enjoyed hot or iced this is a special gift for the whole family to enjoy. BANISH CAFFEINE JITTERS THE TASTY WAY - Naturally caffeine-free USDA organic and pure our Rooibos Red Bush and Honeybush teas are deliciously hydrating and offer a cleansing detox, they are a perfect healthy alternative to black teas coffee and sodas. Ditch the caffeine buzz and drink as many cups as you like! YOU'RE GIVING BACK WITH EVERY CUP - When you buy our tea you're supporting real families and our planet. Every cup of our USDA Organic South Africa tea is harvested by hand and sustainable and ethically farmed. If you have any questions about this product by Rooibos Rocks, contact us by completing and submitting the form below. If you are looking for a specif part number, please include it with your message.